One Great Family SUV With Safety and Very Low Miles. A Must See. One-Owner, Clean CARFAX. Fresh Oil Change, Navigation, Power Sunroof, Heated Seats, Remote Start, All Wheel Drive, Rear Back-up Camera, Leather Interior, Bluetooth Hands Free, Lane Departure Warning, Blind Spot Monitoring, 3.6L V6 DGI DOHC VVT, 19" x 7" Chrome Clad Aluminum Wheels, Chrome Luggage Rails, Chrome Power-Adjustable Heated Outside Mirrors, Driver Alert Package I, Driver Alert Package II, Forward Collision Alert & Lane Departure Warning, Heated Driver & Front Passenger Seats, Intellilink w/Bluetooth, Navigation System, Power Programmable Rear Liftgate, Power Tilt-Sliding Sunroof w/Express Open, Preferred Equipment Group 4SA, Radio: Color Touch AM/FM Stereo w/Navigation, Rear Cross-Traffic Alert, Rear Park Assist, Remote Vehicle Start, Side Blind Zone Alert, Single-Zone Automatic Climate Control, Universal Home Remote. 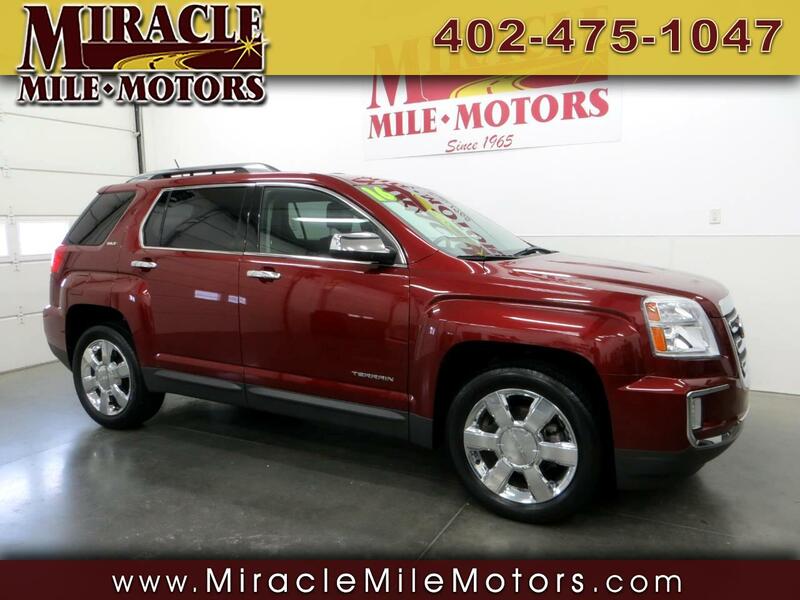 2016 GMC Terrain SLT 4D Sport Utility 6-Speed Automatic AWD 3.6L V6 DGI DOHC VVT Miracle Mile Motors in Lincoln NE have been in business for over 50 years selling premium quality used cars, trucks and SUV's vehicles. We are committed to save you time and money and make your buying experience hassle free and pleasurable. All of our prices are clearly displayed on each vehicle. We offer bank financing , service contracts, and Carfax reports. NO DOCUMENTATION OR HIDDENS FEES. Word of mouth is our best advertising. Please look thru our inventory at www.miraclemilemotors.com or e-mail with any questions. 1-888-465-8963 87th & Hwy 2 Lincoln, NE 68526 Where Friends Tell their Friends to Buy CarS.